K2. John Smitherman, Atomic Veteran. John Smitherman participated in "Operation Crossroads," the first series of nuclear test explosions in the Pacific after the War. He was one of 42,000 servicemen exposed to radioactive fallout from the two shots in the series, code-named "Able" and "Baker". 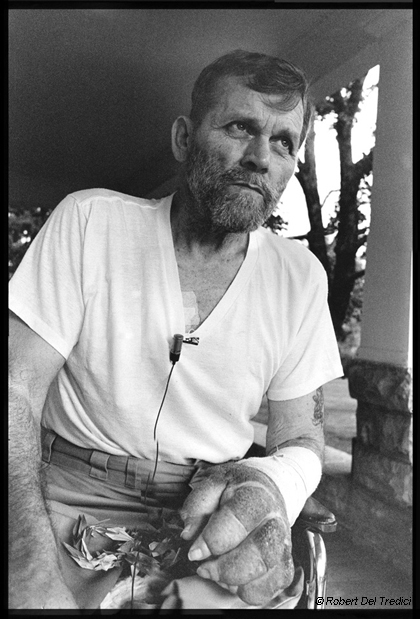 He died of multiple cancers in September, 1983, two months after this portrait was taken. The US government has maintained it is not responsible for his fatal cancers. "We watched the Baker shot from a ship about 19 miles away from the explosion, and mist from the mushroom fell on the deck of our ship and sand fell on our deck, little pieces of metal and rocks. We tried to wash off as much of it as we could. The mushroom cloud stayed in the air for almost two days--we could see that." Mulberry, Tennessee. 31 July 1983.